The 1916 Societies have been reliably informed that efforts on St. Patrick’s Day to promote our legitimate political campaign for an all-Ireland referendum on Irish reunification, through the use of a light-airplane carrying a banner with our flagship message of ‘One Ireland-One Vote’ during the parade celebrations in Dublin city, met with state intimidation and censorship at the hands of An Gardai Siochana. Initially the National Flight Centre in Kildare had agreed to fly the banner and accepted payment in full to that end only to mysteriously cancel twenty-four hours prior to the scheduled flight, claiming it was necessary to do so as the plane had developed unforeseen ‘technical difficulties’. Following contact from local media outlet the Leinster Leader it was brought to our attention that armed Gardai carrying assault weapons arrived at the airport in a menacing show of force, warning its management not to fly the banner. Although suspicions of political interference to some degree or other were already considered as the likely cause of the last-minute decision to cancel our plans we were nonetheless shocked when told the full extent of the sinister and violent role of the state in this incident and are appalled by what amounts to threatening, gestapo-type tactics to undermine and censor our legitimate and peaceful movement. Despite repeated protestations from the state and its organs that this type of censorship has long been consigned to the past this amounts to an alarming development which questions the democratic bona fides of both the Gardai and the state which it serves. 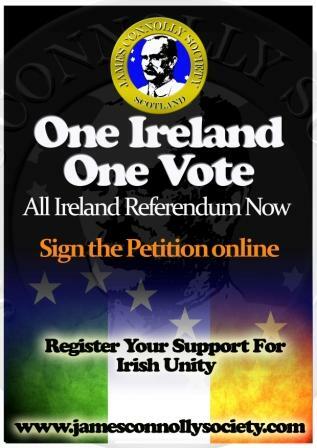 Our message is simple and is a threat to no-one, we see national self-determination expressed through an all-Ireland referendum as the way to bring about the reunification of our country and our work is to that end and that end alone. Such outrageous intervention on behalf of the state to limit free and democratic expression should be opposed by all right-thinking people and ultimately demonstrates the repressive leanings of those in authority in our country today. The 1916 Societies remain undeterred and fully committed to our vision of a 32-county sovereign Ireland where censorship, marginalisation and the apparatus of repression used to enable their implementation are consigned to the dustbin of history where they belong.